A few weeks back I received a few crates of gorgeous green beans at work. The first of many shipments in the coming year. During my coffee break, of which I am the only female in attendance, the subject of pickled beans came up, of course started by yours truly. The conversation during our breaks usually consists of hockey talk, or the business of grocery, shopping trends, busy times, gas prices. But occasionally I will bring up what I am cooking in my kitchen at home. And for a bunch of guys they are pretty receptive! Plus the occasional goodies I bring doesn’t hurt either. When I mentioned pickled beans there was quite the conversation of what each person envisioned when they thought of bean pickles during that break. I had intentions of making mustard pickled beans with a bit of cauliflower and some pearl onions added because really, that is my favourite part of mustard pickled beans. One co-worker was quite adamant that you only used yellow beans when making this particular pickle. Another agreed with me that no, green beans are used. So you can see the contrasting colors. 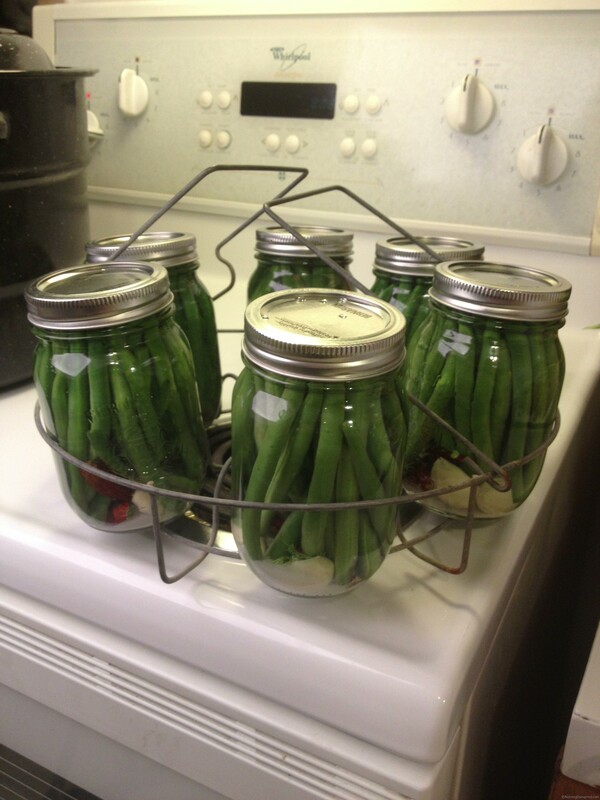 And finally my boss said screw that just make regular pickled beans, they are fantastic in Caesars. This is a fantastic recipe that you make by the jar! Great if you are new to pickling as it is an easy recipe and perfect if you are just wanting a small batch. Wash and heat all the jars you will be using. Place the lids and screw rings into hot water in a small pot on the stove, keep the burner on low and bring the water to a light simmer. Wash and trim all beans to fit the jar. Wash and pat dry the dill greens. In a medium sized pot place the vinegar on medium heat and bring to a boil. 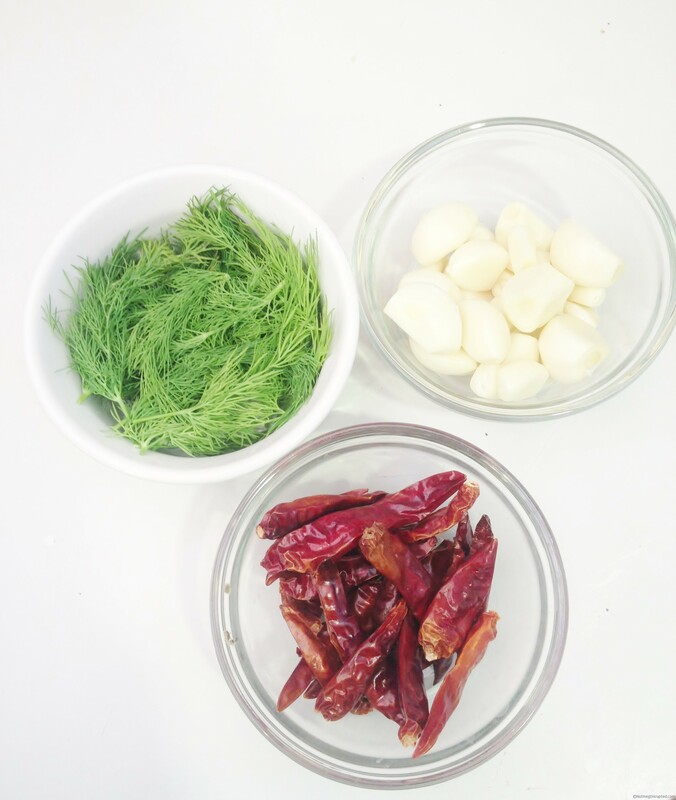 Using oven mitts or a tea towel to handle jars, place 3 cloves of garlic and 2 red chili peppers with a few sprigs of dill in the bottom of each jar. Fill the jars with beans, packing them fairly tight. Measure the salt over the beans. Add a 1/3 cup of vinegar to each jar and top with boiling water within 1 inch of the opening of the jar. Place a hot sterilized lid on each jar and apply the metal screw band on finger tight. Place all the jars into the canner, I like to use the jar rack that came with the canner. It makes fast work of getting the hot jars in and out of the very hot water. Cover the jars with at least once inch of water. Bring to a boil and heat for 20 minutes. Carefully remove the jars form the canner and allow to cool completely. The lids will ping as they seal. Store in a cool dark place for a few weeks before opening. Best if chilled before eating. Seriously delicious with only the slightest hint of heat. I used dried chili peppers so the heat may be a touch more pronounced if using fresh red chilis. 2 pounds of beans yielded 6 pints of pickles. I always use a 5% acidic white vinegar when I do any type of pickling. Call me a purist! Beautiful! What kind of vinegar did you use?